Tonight: Clear. Cool. Lows in the mid 30s. Tomorrow: Sunny. Seasonable. Highs in the mid 50s. Sunday: Sunny. Very nice. Highs in the mid 50s. 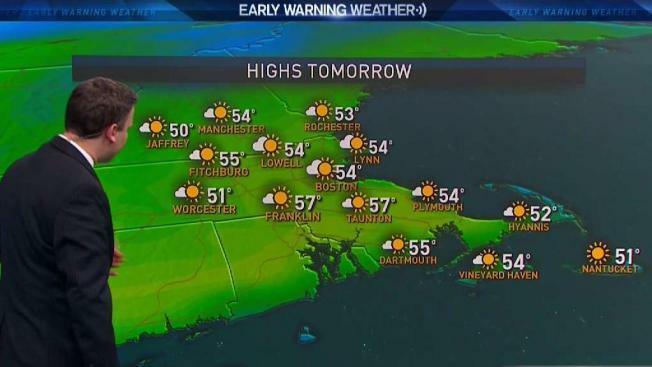 A super stretch of sunny weather is ahead. Friday was a day of transition across New England. It was still snowing in the mountains of Vermont, New Hampshire and Maine, while the rest of New England saw a mix of sun and clouds with a few sprinkles. For Friday evening, we'll see a partial clearing of the skies as temperatures slip into the 30s across New England. The wind will still be sustained out of the northwest at 10-20 mph. High pressure builds in this weekend, allowing ample sunshine and a warming trend. Both weekend days will start with lows in the 30s, but afternoon highs will rebound into the 50s to near 60. Even milder air pushes in Monday and Tuesday, with more sun and more towns in the 60s. Our next chance of rain holds off until Wednesday of next week. In the meantime, stay tuned with the latest weather alerts on the go with the NBC10 Boston and necn apps.